DARWIN providers may request deletion of their DARWINs from the DARWIN's page. This will trigger a process that will result in the DARWIN getting closed in the following 24-48 hours. 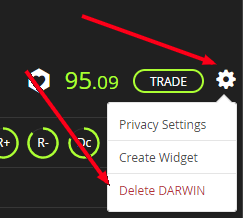 When this happens, any open investments in the DARWIN will get automatically closed at the current quote and the DARWIN Provider and any investor with open investments in the DARWIN, will receive an email notification. Deleted DARWINs CANNOT be restored. Deleted DARWINs will keep appearing on the interface as a part of a Provider's track record, as we believe that transparency is a non-negotiable part of the Exchange ethos.